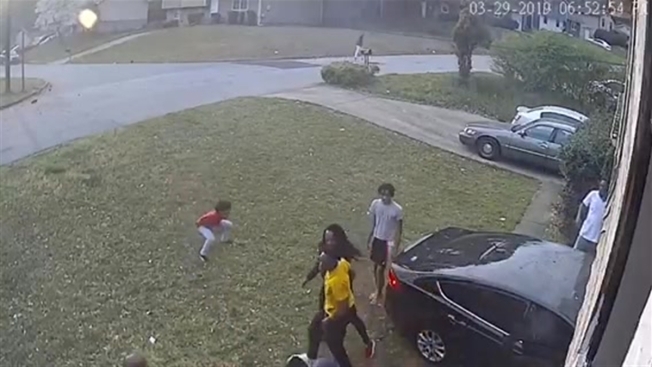 Security camera video shows LaDerihanna Holmes playing with a friend in the front yard of her house in Lithonia, about 20 miles east of Atlanta, when the driver hit a stop sign on a corner across the street, kept going across the girl's front yard and hit her as she tried to get out of the way. After a 9-year-old girl was seriously injured when a car careened across her front yard, hit her and then hit the house, her parents hope the public can help identify the driver. The girl's parents were upstairs inside the house when the crash happened just before 7 p.m. Friday. Charlette Bolton, LaDerihanna's mother, said in a phone interview Monday that the sound was deafening and it felt like an earthquake when the black sedan hit the house. Bolton screamed for her daughter and ran down the stairs and out of the house, where she saw the girl lying on the ground appearing lifeless, she said. Bolton's 12-year-old son and a man started doing CPR on LaDerihanna, and her mother felt a heartbeat. The girl's father, Derryl Holmes, picked up his daughter from the ground and drove her to the hospital, "keeping his hand on her heart to make sure she was breathing and that her heart was still beating," Bolton said. When Bolton arrived at the hospital a short time later, she learned that her daughter's skull was fractured, her pelvic bone was broken in three places and the right valve of her heart was leaking blood, among other injuries. Doctors have been doing tests and X-rays to make sure that her spine is OK.
"She's so tiny. She's only 45 to 50 pounds," Bolton said. "I just don't know how she made it." The car remained in the yard, crashed into the house, when police arrived. A DeKalb County police report says a witness told the responding officer that the driver and passenger of the car ran off. The report says an officer contacted the car's owner, who said her boyfriend had the vehicle while she was at work. A police spokesman didn't respond Monday to an email seeking more information. LaDerihanna is an avid cheerleader and tumbler who loves to do back flips. It may take a long time, along with physical therapy and frustration, but doctors have said it looks promising that she'll be able to do those things again, Bolton said. The family's house was badly damaged and the girl's medical bills will likely be staggering, Stewart said. A GoFundMe account was started for her Sunday to help pay for medical costs. Bolton had a message for the driver and passenger who left the scene: "Y'all thought my baby was dead. Y'all didn't look down at my baby one time, and I want you to turn yourselves in." Bolton wants the driver and anyone who might be helping shield him to be punished, she said. But more than anything, she's grateful her daughter is alive. "I asked God to save my baby and he did," she said. "I can take this long road. I couldn't have handled planning a funeral."